By the mid-1980s, Audubon was lobbying for an exciting new educational resource that would highlight aquatic habitats while reintroducing New Orleanians to their own, legendary Mississippi River. Where decaying warehouses blocked public access to the river’s banks, Ron Forman, his team, and their supporters envisioned a lush community park with a sparkling centerpiece: Audubon Aquarium of the Americas. Vision became reality as local citizens overwhelming approved a millage to service $25 million in bonds to fund construction of the Aquarium and Woldenberg Riverfront Park. The project not only set a new, broader course for Audubon. It promised the city a much-needed family attraction that could drive its tourism industry to new heights. Woldenberg Park opened in 1989, the same year the Friends of the Zoo evolved into Audubon Nature Institute. 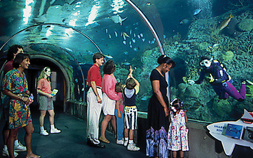 The Aquarium followed in 1990, drawing huge crowds for its Labor Day opening. Four months later, the facility had already exceeded its first-year attendance projections. And Audubon Nature Institute was ready, once again, to leverage its success for new achievements.